Get behind the wheel of a 2017 Subaru Forester, and you'll begin to experience the world in a whole new way. The Forester is designed to help you get where you're going and take along all your important belongings as well. It has a host of protective features, and the vehicle is designed to get you to your destination in comfort and style. You'll love the efficiency features that help you get more done with less effort, and upgraded interior features that make this vehicle stand out from its competitors. Give us a call, we're giving out 2017 Subaru Forester quotes to Metro Detroit MI residents. When you call for 2017 Subaru Forester quotes, you'll also be able to schedule a test drive to check out how the vehicle handles. An available option on the interior is an upgraded leather-trimmed upholstery with contrast stitching that adds a touch of design and resilience to the vehicle. The front seats have driver memory functions, and you'll love the ability to always have your perfect seating configuration with the touch of a button. The center console doubles as an armrest and storage bin, and you'll be able to take all your belongings along for the ride. Reclining rear seats ensure the passengers in the back can get some much-needed rest, and a heated steering wheel feels warm to the touch on cold winter days. For warm summer nights, you'll have the option to get the panoramic power moonroof to view the stars at night. Our 2017 Subaru Forester quotes to Metro Detroit MI residents are available, but you have to pick up the phone and give us a call. Check with us online or by phone, and get a test drive scheduled along with your 2017 Subaru Forester quotes. The outside of this vehicle is as feature-rich as the interior. When you come test drive this vehicle, you'll notice it has exceptional ground-clearing capabilities. This is largely thanks to its 17-inch or 18-inch aluminum alloy wheel options. You'll get 8.7 inches worth of ground clearance, which makes it easier to clear rocks on worn mountain paths. LED headlights power your vision at night, and you'll love the fact that they use less energy and give you a brighter view of the road. Steering responsive headlights also help to light the way based on where you're turning, so there are never any surprises on dark mountain roads. Come check it out for yourself at our dealership serving Metro Detroit Forester shoppers. Before you come in, request a 2017 Forester from Glassman Subaru online. You've got a few engine options to choose from depending on the trim level you choose. Get a 2.5-liter engine that outputs 170 horsepower and 174 lb-ft of torque. There is also a 2.0-liter turbocharged engine that outputs 250 horsepower and 258 lb-ft of torque. The vehicle also has a maximum towing capacity of 1,500 pounds, so you can take a trailer or small vehicle along with you on your trips. The X-Mode features works to optimize engine output so you get excellent efficiency and it also manages the transmission ratio. Essentially, it works to keep your wheels on the ground, reduce wheelspin and give you optimal traction. Our dealership is proudly serving Metro Detroit Forester shoppers, and we want you to request a 2017 Forester from Glassman Subaru online. 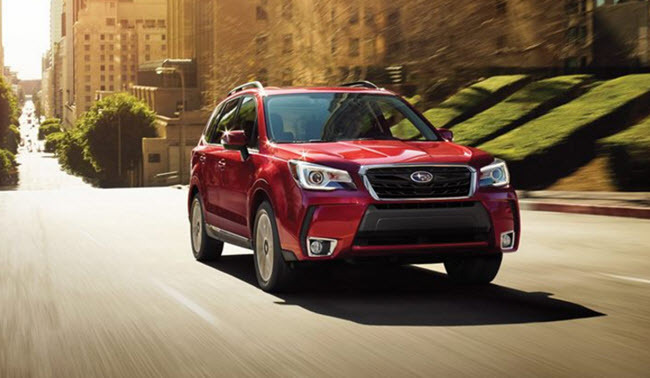 The 2017 Forester is kind to the environment, and it exceeds California's strict emissions standards. This vehicle offers lower emissions than certain hybrid models on the road, so you know you're getting a vehicle that is capable of lasting a long time. The vehicle uses a symmetrical all-wheel-drive system that works hard to give you exceptional stability. You'll also get maximum traction and a suspension system that will help reduce the bumps and dips on rocky roads. This vehicle is designed to be efficient in its handling, response and drivability. This is a vehicle that will stand the test of time and provide you with years of reliable and quality service. Contact us to get 2017 Subaru Forester quotes to Metro Detroit MI residents. When you get your 2017 Subaru Forester quotes, you can also ask about scheduling a test drive. If safety is what you want, this vehicle delivers in the 2017 model year. You'll love the EyeSight Driver Assist system that scans nearby traffic and adjusts your cruise control to stay at an appropriate distance. The vehicle can also warn you when you're swaying in and out of your lane, and it can slow down the vehicle if it senses a dangerous situation. Blind spot detection prevents you from running other vehicles off the road, and cross-traffic alerts can let you know if any traffic is coming upon you when you're backing up your vehicle. The reverse automatic braking system can even apply the brakes to help you prevent a collision when you're backing up. A host of advanced protection systems are in place to help you stay safe. Come see our dealership serving Metro Detroit Forester shoppers, and request a 2017 Forester from Glassman Subaru online. Give our dealership a call to get our 2017 Subaru Forester quotes to Metro Detroit MI residents. We will tailor your 2017 Subaru Forester quotes to your specific needs and wants when you request a 2017 Forester from Glassman Subaru online. Our dealership is proudly serving Metro Detroit Forester shoppers with some of the best deals around.